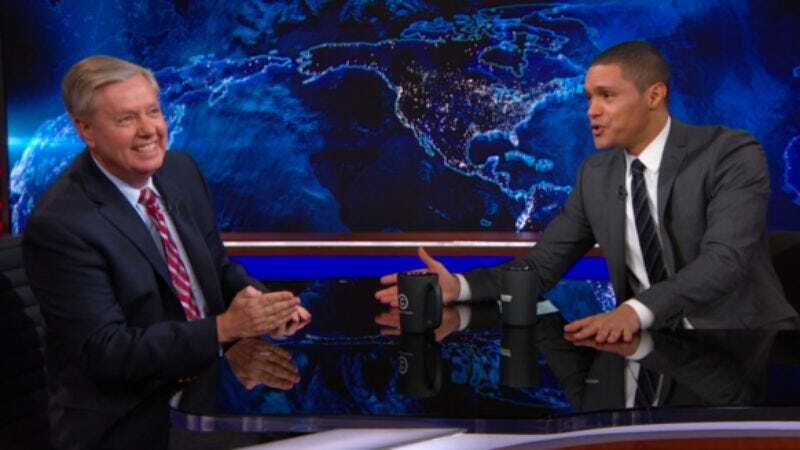 Lindsey Graham dropped by The Daily Show Wednesday night, where host Trevor Noah helped him turn his sour grapes over dropping out of the presidential race into a fine, funny wine (what, isn’t “humor” one of the notes people look for in their wine?). Graham backed away from his earlier homicidal comments about failed impressionist Ted Cruz, and when Noah pressed him about just how in line the Republican party’s beliefs appear to be with its pseudo-pompadoured frontrunner Donald Trump, Graham tried to change the subject with jokes about President Obama and Noah’s citizenship. Graham admitted that his surprising endorsement of the GOP’s plan B (that’s Cruz; Trump is “plan B Great Again”) is the result of wanting anyone but Trump to win the party’s nomination. And the senator appeared to put his money where his mouth is when he said he’d back John Kasich, a guy who was beaten by the ghost of Marco Rubio’s ambitions in Arizona. But in an effort to present a balanced view—this is a fake news show, but still a news show—Noah and Graham made Trump compliments the stakes of their pool game.